One of the most common questions we are asked as a cabin rental company is “What to do in Gatlinburg during our vacation?”. This question, while broad can be answered many different ways. Before we can suggest a Gatlinburg cabin or activity for you to participate in, we first need to know a little about you and your interests. Gatlinburg and the Smoky Mountains are home to thousands of things to do including places to eat, trails to hike, shows to enjoy, local shopping, you name it! Let’s get to know you better so we can tell you what to do in Gatlinburg during your vacation. 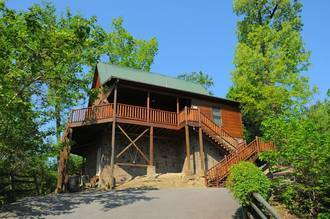 What type of Gatlinburg cabin rental are you looking for? This question is important because where you stay in Gatlinburg is critical! Do you want to be close to all the action in Gatlinburg? If you answered yes, you’re in the right place. Our Gatlinburg cabins are only 5 minutes from the main drag which includes local attractions, dining and shopping. Not to mention, the Great Smoky Mountains National Park! Before booking a place to stay, know how many bedrooms you will need and visit our website. Our website has our cabins grouped by the number of bedrooms, pet friendly and other amenities offered. What type of vacation do you typically take? Do you dine out every night on vacation? Is shopping what attracts you to the area? Do you already have a list of attractions and dinner shows the family will be attending? If you answered yes to any of these questions, here is what we suggest. Staying so close to Gatlinburg you will be close to all of the wonderful dining options in Gatlinburg AND Pigeon Forge! Visit the Island at Pigeon Forge for unlimited dining options and a little shopping too! If you are interested in the attractions and dinner shows, may we suggest the Ripley’s Aquarium, or the Titanic Museum. For dinner shows, try the Comedy Barn, a family friendly dinner show with a side of laughter. Or perhaps the Dixie Stampede where you will learn more about Dolly’s hometown and the pride of the south! Book your stay today and find out all the things you can do in Gatlinburg! Call our front desk staff with any questions you may have about the area or must see places on your vacation. We look forward to seeing you soon!